If you shoot enough image sets and merge them to HDR you’ll eventually have to deal with ghosting. Ghosting occurs when an object in the scene was in motion during exposure of the image set. Each image records the object in motion in a different position and the final HDR image will display the object in a “rubber stamp” look. This article addresses methods to deal with ghosting. There are basically two methods to reduce ghosting: during shooting and during post-processing. 1. Shoot in continuous mode. 2. If your camera allows you to set order of bracketing choose: Meter, Under, Over. This is better than Under, Meter, Over. Why? Merging just the Under and Over exposure is often a good alternative and if they are shot back to back then motion is minimized. 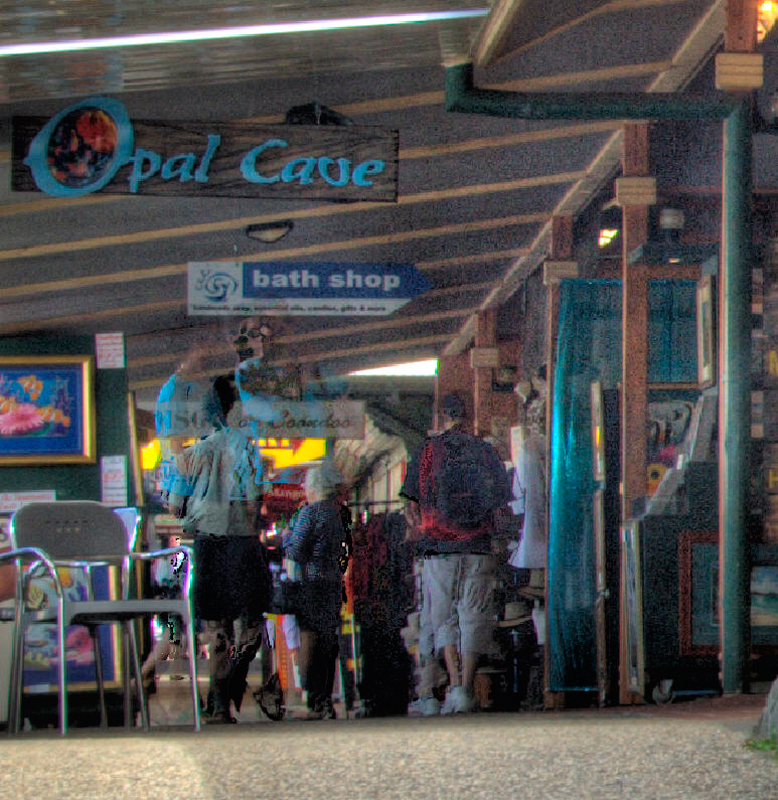 Create the HDR image (use Ghost reduction) then blend one of the single exposures into the HDR image. But which is the best single exposure? The answer is to choose the best exposure of the ghosted object. Sometimes, however, you may favor a particular image based on the position or look of the object in motion. This is ok but you may have to deal with a poor exposure that introduces noise. Here’s a five image set that captures the full dynamic range of the scene. It was shot hand-held in continuous shooting mode. In the shaded area the people walking have ghosted and destroyed the details in the HDR image. The best single image to use for blending is the +2EV image as it captures most of the details in the shaded area. 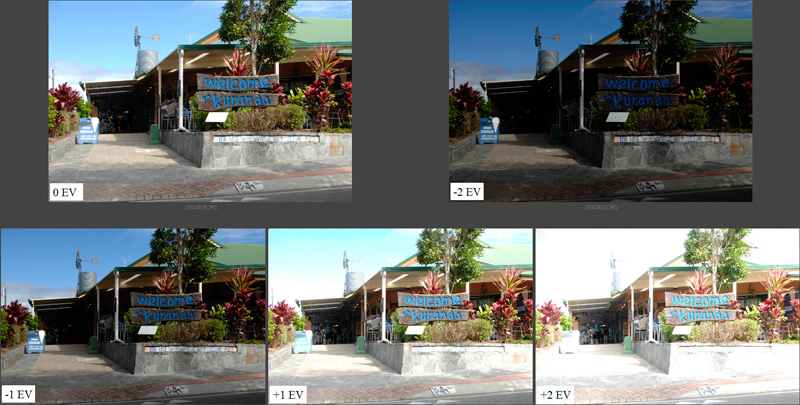 The top image is the HDR image and the bottom image is the single +2EV image that was tone mapped using the same settings as the HDR image. Had I preferred any other single exposure of the image set (0EV, -2EV, -1EV, +1EV) I would have to deal with the potential for noise. Drag the +2EV image over the HDR image (hold the shift key to center). To show the masked area in pink there is a neat little trick – press the “\” key. Notice the masked area includes some of the underside of the awning – I did that to eliminate some noise seen when zoomed in. Here is the final HDR image with the ghost problem repaired. Remember that ghost repair may require another single image – for example the 0EV for the leaves in the tree. For this scene along the beach in Australia I took 5 images at 1EV spacing. Tripod and continuous shooting mode was used. I decided to minimize ghosting in the final HDR image by only merging 3 of the 5 images, the 0EV, +1EV and -2EV. I chose the +1EV because it captured the best position of the swash onto the beach. Notice the ghosting in the swash – you can pick out the 3 exposures – the first is the 0EV, the second is the -2EV and is just a fine line due to the faster shutter speed and the last is my favorite exposure which is the +1EV. 1. Background is the HDR image with ghosting. 2. “Plus 2EV image” layer is the tone mapped single +2EV exposure. See black mask with white. 3. “Bi-Color Violet/Pink” layer. I added this layer simply for a color cast. The final image with ghosting removed from the swash. Thanks for the information. I always wondered how to remove ghosting. I Will try with my shots some time soon. Hi, Ferrell. Thanks for this helpfull instruction. I would like make better my SQL knowledge. get more about SQL for my position as mysql database manager. HDRTools has a Separator function in the HDR processor.The instructions for HDRTools aren’t strong, so (if you update your book, and I will buy it if you do!) could you expand on the tutorial for HDRTools, similar to your Photomatix tutorial? The nuances of FDRTools, including the Separator for ghosting, are a bit confusing. It became cold and cloudy! This tutorial makes the assumption that you will have an image in your batch collection that will have the EXACT color you need for fixing the hdr image. This is almost never the case so basically you have to find the image from your batch collection that most closely matches your hdr image and then do a ton of processing on that batch image to get the color to match your hdr color exactly so that when you mask, the colors will match. Just wanted to let people know so that when they try and follow these instructions they’ll know why they’re not getting the results they expected.